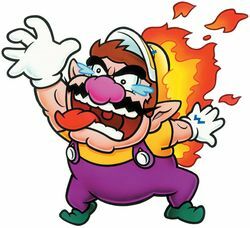 Flaming Wario, originally known as Hot Wario, is a transformation in the Wario Land series. When hit only by a Flame (a torch-holding fox enemy), a Fire Robota, a Kaentsubo, or the flames from a Pig Head Statue or Aerodent, Wario will comically start racing around with his overalls on fire (similar to Mario running around with his overalls on fire from Super Mario 64). In this state, he cannot be controlled, except for jumping. Soon, the flames will spread across his entire body, making him essentially a living Fireball. He can now be fully controlled (although slowed down a bit) and can destroy Bonfire Blocks. This can be cured, obviously, by falling into water or just waiting until he burns out. Ball o' String Wario combines this ability with Snowman Wario. In Wario Land: Shake It!, Wario can once again use this form; however, it can only be activated by coming into contact with a small fireball creature. Wario can also break Bonfire Blocks with this ability. Flaming Wario makes a minor appearance in volume 28 of Super Mario-Kun. Aerodent sets Wario on fire. Hoggus attempts to help Wario, but aggravates the situation instead, angering Wario. Wario responds by contacting Hoggus while Wario is encased in fire. 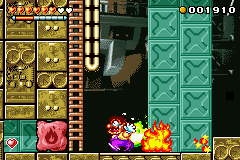 Flaming Wario was one of three Wario transformations appearing in Densetsu no Starfy 3, along with Bubble Wario and Puffy Wario in Wario's cameo appearance in Undersea Ruins. Flaming Wario's sprite in Wario Land 4, has his hat gone, while in the artwork and his sprite in Wario Land II and Wario Land 4, his hat is seen. ↑ Wario Land Advance: Yōki no Otakara Japanese instruction booklet, page 30. This page was last edited on April 12, 2019, at 13:17.